Hello Everyone! I’m sorry I’ve been so MIA lately! Thank you for your patience with me and not unfollowing me! Seriously y’all, thanks for sticking with me! As promised I will be attending the BEA conference. A little late but still excited to be able to attend and enjoy. I hope to have some great giveaways coming soon! Will I see any of you there? Is there any author attending you would like to see giveaways from? Let me know! As for Giveaways since I haven’t decided on what to giveaway this month, it will have to wait. However, Elle Casey is have a huge indie giveaway Elle Casey’s Springtime Indie Book Giveaway. 190 titles and 1,554 copies to give away. Be sure to check it out by clicking here. And last but not least Happy Mother’s Day. I would assume that anyone who is an avid reader knows what is like to have a lot of books on your hands. As a book blogger this number has seriously increased. The other day while adding a book to the pile, I had to take a step back when I realized that even with two bookshelves, I had no where to place the book. Upon further inspection, I found books that I had forgotten I have. Mind you, books I’ve been very much anticipating, have been collecting dust. 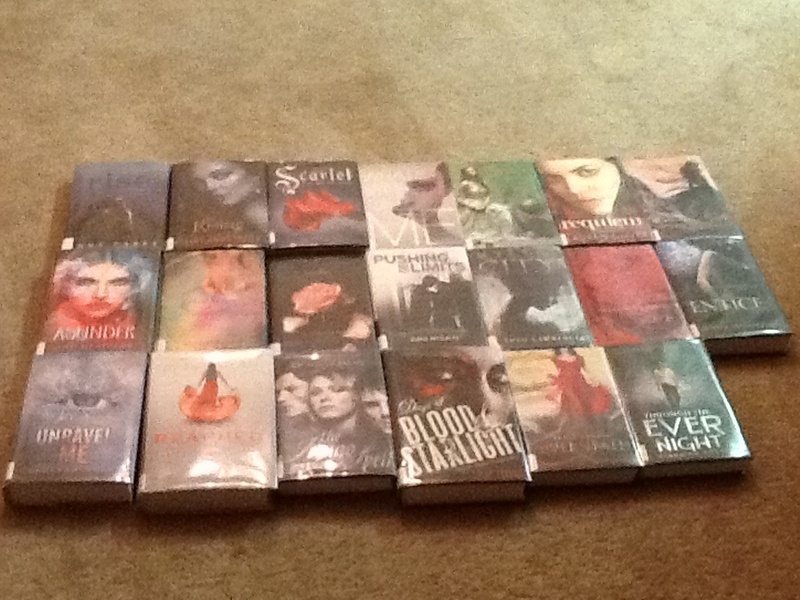 I have an amazingly large TBR shelf, and the picture doesn’t even begin to cover how much my ebooks add to the list. So I have a new game plan. I will be spending the month of May reading all of the books pictured above. If I manage to fit in a few ebooks too, I’ll feel all the better. Hey guys! I apologize for my radio silence as of late, my life has been a little hectic. So I have a lot of catching up to do! First order of business, two lucky gals entered and won our Cindy C. Bennett Author Spotlight Giveaways. The first, an ebook copy of Geek Girl was won by Cassandra. The second, an ebook copy of Immortal Mine was won by Martha. Congrats to you both! I will be in touch with the author and you should be receiving your prizes soon. Second, I did promise an BotM Giveaway for April. Well, I had no clue what to giveaway, sorry for my delay. That crux was resolved, as I just read a book that I thoroughly enjoyed The Eternity Cure by Julie Kagawa. It was amazing and a review should be up within a couple of days. The giveaway will be available in both Hardcover and ebook and yes that includes international. I’ve just discovered the awesomeness that is the Book Depository and if they ship in the winner’s area (country) then that format (hardcover) will be available to said winner. To enter this Rafflecopter Giveaway, Click Here Good luck! I hope to have them all published by the end of the month. Have any of you gotten any weird emails from me? If you did, I apologize. It just so happens that one of my email accounts was hacked. Those of you who were affected by this, sorry. Password has been changed and I’ll be more careful of the wifi connections I use. I am happy to announce that the winner of our December BotM Giveaway of a $10 Amazon gift card is Duks. Congrats! Thank you to all who entered. Truly, I have learned why everyone raves about Rafflecopter. They are truly the way to go. With that being said, don’t forget that there are still a few days to enter the giveaway to win one of four ebook copies of James Agee’s Jr’s Mask City. If you haven’t entered or are looking to get a last minute entry be sure to click here. Have you guys noticed my absence this past week? I apologize for that. To make it simple, I was overwhelmed. I was just getting back from a vacation, my oldest was returning to school and then there are a few curve balls life has thrown me. So again, sorry. With my apology being put out there, I wanted my first post of the year to be my blog-olution (blog New Year’s resolution). In warning it will be long and might get a little sappy. First, a lot has changed in me and in my life since I started blogging. And truth be told, blogging is a lot different for me now than it was in the beginning. At first, I took it easy. I had few obligations in my personal life, I found the the perfect excuse to feed my book obsession (and loved it) and keeping to an every other day schedule while reading one book every other day was fun and easy. I enjoyed writing random stuff that would allow you guys to get to know me and with time, I forgot how to have fun with it. Lately life has thrown me a few curve balls and the TiffanyLovesBooks has turned into something else. I thank all of you who have stuck with me through all of this and I ask that you continue to stick with me. To be honest my biggest blogging resolution this year is to find a way to make it fun again. To bring back the spice to this relationship… 😉 Haha… But seriously, I have a few ideas (my blog-olution) to make things better for me, and hopefully for you too- things to make it fun again. So here it goes: first, my posting schedule will be changing. Instead of my every other day, which became very difficult to keep up with, I will be posting three times a week. No specific days, just three times a week. If there are more, then great, but that’s my quota. Next, in all of this brainstorming, I’ve realized that along the way, I lost sight of what I wanted this blog to be when I started it. I have excelled in some areas, like the Author Spotlights but I had so much more planned. Like keeping you guys updated on all the great giveaways that are going on, keep you updated on our favorite authors and stuff like that. Which is the second part of my blog-olution. I won’t lose what I have going now, but I’ll merge what I already have with the image of what I wanted this blog to be. And lastly, those of you who have regular correspondences with me know that I’m an amazing procrastinator, my goal is to be more available. If you got to this point and read all of the crap above, I would love to hear your opinion. Do you think the changes I have in mind will have a positive effect on TiffanyLovesBooks? We there some changes you would like to see that I haven’t mentioned? Is there anything that you would absolutely disown me for if I changed or got rid of? Hurricane Sandy is coming my way. I am being told to expect power outages and if this happens to be the case, I ask that you guys be patient with me; Authors and readers alike. As my power being out will interfere with my posting schedule. I also ask you guys to send your thoughts and prayers to the families whose lives Sandy has affected and hope/pray that no more families become victims of this hurricane. Author Margaret Chatwin has called Roosevelt, Utah home for the past twelve years, but her roots are in the the beautiful Heber valley. Since the age of thirteen Margaret has been taking amazing adventures through her writing. Writing has always been very personal and private to her. Recently, however, she has chosen to share her talent with the world. She has written over fifty novels, and currently has three published. Margaret likes to “mix it up,” writing many different types of books within the fiction genre. I had two reasons for wanting to start the Author Spotlight. One is Margaret Chatwin and the other you will meet next month, as she is our next spotlighted author. Until recently I had no idea what an Indie Author was or how tough the plight of the self-published writer could be. I happened to of have picked up Margaret’s book 101 in Goodreads Shut Up & Read group for a Read it & Reap. This is a program where writers giveaway a limited number of books to readers in return for a review. By the time I was done reading it, I did my usual of stalking the author. I know that may sound extreme, but all I mean by that is that I like to know more about writer’s whose books I enjoy. I like to see what other books they have published and check out their blogs… Stuff like that. So yes this is the norm for me. So as I begin my background check on Margaret I found out what an indie writer is. I was already in love with her book and I felt a certain way about her the more I learned. What way you ask? I cared. I wanted to help this amazing writer who clearly wasn’t getting the proper amount of recognition for her book. At some point after reading her book I reached out to her and to be honest, helping her was one of the reasons I rushed to start my blog. She is someone I want the world to know about. I have had a great time collaborating with Margaret to make this possible. If you are wondering what it is you can expect, here it is: Margaret has three published works, which will be featured this month. Every week one of these books will be reviewed and you, the reader, will have seven days to enter to win a free pdf copy of that book. That is until the last week of the month where Margaret will generously be giving a paperback copy of all three books to one lucky winner. Everyone will have a chance to enter. However, in trying something new the last giveaway will accompany a quiz in which every correct answer gives an additional entry to the entrant. The quiz will be limited to the posts pertaining to the Author Spotlight. Many of you entered the August BotM Giveaway in the hopes of winning a copy of Shatter Me. Well today I am happy to announce the winner. 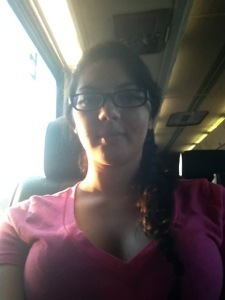 As previously stated, the winner was picked using random.org and she is Valerie. Congratulations Valerie! Thank you to everyone who participated and best of luck in the giveaways to come. The Forbidden and Fifty Shades of Grey Giveaway ends September 30th. Every person will be allowed a maximum of three entries. One in choosing the book and one in choosing the format and the last in following this blog. Forbidden will be offered in Paperback, Hardcover and Ebook. Fifty Shades of Grey will only be offered in Paperback and Ebook. Every entrant will be emailed and notified of how many entries they have qualified for. The winner will be announced October 1st and will be allowed 48 hours to respond. If the winner does not respond within that time frame, another winner will be announced. Best of luck! To enter the Giveaway please go here.